It's about dreams, and how to achieve them. On a trip to Prince Rupert, I was inspired by the simplicity of the shapes and lines of the stylized native art I saw in the museum. In First Nations tradition, the salmon represents persistence. It goes against the current toward one simple goal: the survival of the species. 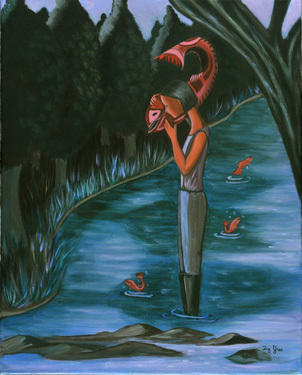 Fishing is an untraditional role for women, but I believe women can achieve anything just like the women in my paintings. This piece keeps me going, whenever I feel exhausted or lacking in inspiration. I hope she will inspire you the same way that she inspires me.